This R&B outfit had two distinct phases of chart success. The first phase was with Paul Jones who left the group in the summer of 1966. He was replaced by Mike D'Abo which marked the beginning of an equally successful second round of chart hits. The band had been started by Manfred Mann shortly after his arrival in Britain in 1961. He had joined up with percussionist Hugg to produce the jazz and blues group 'Mann Hugg Blues Brothers'. 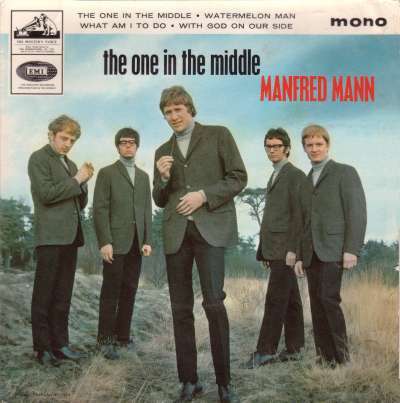 However after expansion of the group to a fivepiece, they simply became Manfred Mann taking their name from the enigmatic keyboard player. The addition of Jones was noteable because it was he that steered the group wholeheartedly to R&B. The title song of this 1965 EP (7EG8908), displayed on the right, was written by Paul Jones. Although he wrote it for the Yardbirds they rejected it and this EP was the result. My own preference is for their interpretation of "Watermelon Man"- one of the great R&B numbers they loved to play, but seldom recorded it seems. Although their first singles didn't chart, success came with '5-4-3-2-1' which was co-written by Jones, Hugg and Mann. The success of the single was helped enormously by its adoption to introduce the TV Pop show 'Ready Steady Go'. A stream of hits followed including two number ones, the second of which coincided with the departure of Paul Jones. He had decided that his future lay in a solo career but, although starting reasonably well, it turned out not to be a wise move. The band auditioned a handful of singers to replace Jones, including Rod Stewart and Zoot Money. However, it was the lead singer of the hitherto unsuccessful 'Band Of Angels' that got the job. This was a traumatic time for the group because they had to sustain the loss of Vickers as well as Jones; they also changed their recording label to Fontana and added bassist Klaus Voorman. They didn't have to worry for long. Their first 'D'Abo/ Fontana' single 'Just Like A Woman' and its follow up 'Semi-Detached Suburban Mr James' were both major hits. The latter record had originally been entitled 'Semi-Detached Suburban Mr Jones', but they had modified the name in case any fans thought it was an intended slight against their former harmonica playing vocalist. By the end of the 1960s the group split up despite their continued commercial success. Mann and Hugg continued in a new guise as 'Chapter Three' before moving on to form 'Manfred Mann's Earth Band'.